In February, the CompactFlash Association announced the CFexpress 2.0 specification, a follow-up to the CFexpress 1.0 specification first revealed in late 2016. The new 2.0 spec update brings two more form factors to CFexpress, both targeting industrial and professional imaging markets, according to the association. The two new form factors join the original, ushering in Type A, Type B and Type C cards. CFexpress 2.0 Type A cards are the smallest of the three form factors at 20mm x 28mm x 2.8mm, which is a bit smaller than a standard SD card. The Type A cards feature a Gen3 PCIe interface with 1 lane and a maximum theoretical performance of 1000MB/s. The Type B card has the same dimensions as XQD cards at 38.5mm x 29.8mm x 3.8mm; this variety has a Gen3, 2 lanes interface and max theoretical performance of 2000MB/s. Finally, the Type C form factor is largest at 54mm x 74mm x 4.8mm with a Gen3, 4 lanes interface and max theoretical performance of 4000MB/s. The different form factors offer manufacturers flexibility in choosing which card type their devices will utilize, such as the small card with a priority on compact size instead of transfer speeds, or the largest card with a focus on speed at the expense of compactness. Japanese publication DC.Watch shared images of these different card form factors earlier this month. According to the CF Association, the CFexpress 2.0 specification is designed for a variety of needs, including imaging, which specifically includes DSLRs, mirrorless cameras, drone cameras and video cameras. Type A is dead meat since both SD Express and microSD Express have PCIe Gen 3 . Nightmare. Kill this stupid idea quick. Last we need is to expand the number of formats needed for camera storage. Sony is putting out UHS-II with 300 mbs read/write and this will only improve going forward. The only reason to do this is margin, smaller lots of overpriced cards manufactured and proprietary requirements. SD speeds will indeed improve, to 985MB/s with the forthcoming SD Express (which is plenty fast for my uses! ), but CFExpress Type B is twice as fast again (and arriving sooner) so will benefit _some_ use cases, but not the mainstream. What have you and so many others got against a faster and larger option for a high-end product sector? XQD/CFExpress can also offer more physically robust options, with some special metal-cased rugged models already available or announced. So Type B goes forward for the higher end DSLR and mirrorless market as the current standard, then. I wonder, in practice, what will prove to be the threshold, point of pain, whatever, between A and B? At 29mm the standard B cards are just a touch wider than SD and I wonder if that's kind of been behind the design choices to almost never include two of them. Yup, I hope makers of smaller cameras take a good hard look at Type A and where they are now with SD....but will they? Type C? Almost the form factor of an SSD device and the capacity to match, no doubt--a studio or TV network's dream for video but not a paragon of portability. Just what we needed... Not! I mean, it's PCI-Express, so type A is going to be easily adaptable to type B, which will be adaptable to type C, and varying thickness is obviously there to accommodate this. I guess hoping for type C to become the predominant type is wishful thinking. That would have the advantage to easily allow you to reuse virtually any camera card format. We can expect type B becomes the prevalent type in most serious cameras. You will be able to use a type A-to-B adapter, presumably an SD adapter, and the physical format is the same as XQD, so we should reasonably expect XQD cards to work in CFEx type B slots. Probably the worst thing that might happen is if manufacturers jump on type A, since you won't be able to adapt anything to type A (compared to SD, it's 4 mm smaller in both directions, and 0.9 mm thicker). @toughluck: "I guess hoping for type C to become the predominant type is wishful thinking." Yes, because it is huge: at 54x74mm (2"x3") more than twice as big (area) as old Compact Flash. I do see hope for adaptors to use SD Express and CFExpress Type A cards in a CFExpress Type B slot, though at half of Type B speed. So many silly comments here. 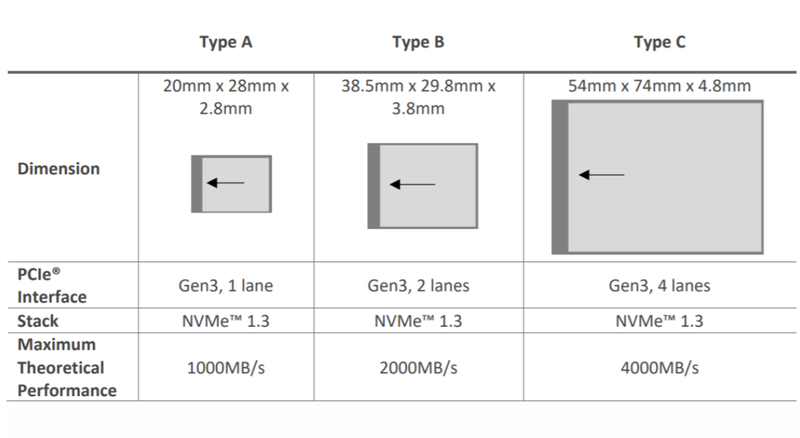 Don't you people realize that different dimensions are not just for speed variation (the number of PCIe lanes), but also for different capacity possibilities. The Type C will probably have twice higher capacities than Type B and four times higher than type A. And there's nothing wrong with the good old CF. It still is a better card format than SD. At least for in-camera use. Those two formats will probably cover it for most cameras. The far bulkier but even faster CFExpress Type C will be for high end video gear, offering a standard in place of a jumble of proprietary removable media formats currently used in that sector. Well, yes, CF is being replaced by CFexpress. And all three types make sense to me. But if you google some real world memory card comparison tests, you will see that the old and "obsolete" CF still beats the UHS-II cards at in-camera operations. People are bashing CF for no good reason. Well that makes perfect sense and is easily understandable for the average consumer. .... says absolutely no one who reads this article. Any chance Type A cards will be able to use adapters for Type B and Type B for perhaps Type C slots? Similar to how you put a Micro SD card in an SD adapter. So now I will have 3 different card slots in my camera? Does this mean I will have to be careful when I buy to avoid the "wrong" card type in both card and camera? The more I read, the more I realize I will stick with my D800 and D500. How big will the camera have to be to fit a 2 1/8 inch by 3 inch card? Sony Mavica anyone? I doubt it; only Type B (same form factor as XQD) is likely to be on interchangeable lens stills cameras; the bigger type C is for other uses like big professional video cameras. Type A is a mystery; maybe aimed at compact cameras or other small devices as an SD competitor. No reason a camera would have more than one type of CFExpress slot. For those who value raw speed, prosumeably the core target market, why the hell would you offer us two lesser products than the top end? ...and not only at a lower speed, but different physical interface? Am I the only who thinks all three ‘classes’ of these should be the same size/physical form with speed being the differentiator? Surely this is logical from a production & sales forecasting POV!? SD is a fine standard but I can understand needing something better and faster but not this with so many options. It's not a great thing. I'm pretty sure we are all wondering the same exact thing. It makes no sense in my mind. The 3 versions make perfect sense. Type B will be the most common standard in still cameras, and a 2000 MB/S speed along with a 1tb capacity will allow for faster buffer emptying and offer all the speed one might need for video. Type A will be used in cameras where size is important in a similar way to micro-SD is used now. It will also offer a big speed and capacity advantage over current cards. Type C is obviously designed for professional video applications. It will be very fast at 4000 MB/S and capable of huge capacities. It seems simple to me, and slightly odd to hear people on a tech site displaying such Luddite tendencies. If you need speed then this standard is no good. The fastest cards today are 400MB/s. Yet today I can buy 2800MB/s SSD from Samsung. So evidently this standard is DOA. It is trying to present a future that is already obsolete. These XQD CFExoress cards are nothing but vendor lock in I.e. as Nikon have nothing on offer technologically speaking they use proprietary expensive cards to make sure current customers stick around and buy their half baked cameras. That is ugly. It is neither useful nor good in anyway. SSD is not a format. There are multiple SSD formats, none of which are particularly well designed for constant plugging and unplugging. The whole point of CFExpress is that it is a durable format, flexible and very fast. It offers the performance of SSD in a practicle form. The cards are extremely robust and designed for camera use, SSDs never were. It's funny hearing the same arguments made about this as I remember from the VHS/DVD days. Thunderbolt 3 is a port standard, that's a long way from a useable card format. What makes you claim that it is more durable than CFExpress? The Thunderbird 3 plug has a much smaller metal to metal contact surface that XQD/CFExpress and relies on friction to hold it in place. The larger contact surfaces of the XQD and that fact that its tension is maintained by a latch rather than friction suggests that it will last substantially longer. For it to be relevent to this conversation someone would have to design a Thunderbird 3 card, which is surely what you are moaning about in the first place. Just do SD and stop this BS. This new standard delivers exactly nothing except confusion. We see Nikon and Canon cameras failing due to the obscure choice of memory cards. Enough is enough! If vendors don't stop the nonsense market will. The ATA protocols SD uses date back to the 70s. Those protocols were developed for spinning magnetic platters. Drivers and error correction are hard, witness Sony's problem with corrupted images. PCIe is modern, with a much higher potential bandwidth. Also error correction from this century. They were designed for column strobe. @pwilly Wake up . it is now 2019 and PCIe is in the SD Express cards. While XQD is upgradeable to CFExpress by simple firmware updates, SD is less certain. It needs the device to allow PCie or NVMe interfaces to be enabled. The new SD specs will most likely need a compatible slot in the camera to make it work, I am not sure that any of the current SD based cameras have this feature. I now have 3 cameras that use XQD, and will be upgradeable by firmware to CFExpress. The cards are much more solid, buffer write times are staggeringly fast and so far I have found them to be 100% reliable. I was hoping that Leica would use XQD in their new Q2 as that would make my upgrade decision from the Q even easier. XQD/CFExpress is a great format, and I'm fairly certain it represents the future for high data volume applications. @P10004K Find a camera that supports SD express. Maybe next year for SD express, and I'll wager it still can't implement all the possible error correction. XQD firmware upgrades to CFexpress. Sorry $300 SD cards are absurde. @pwilly Most pro mirrorless still and pro video cameras use UHS-II SDXC cards. SD is in 99% of cameras . UHS-III and SD Express will be on most future cameras. 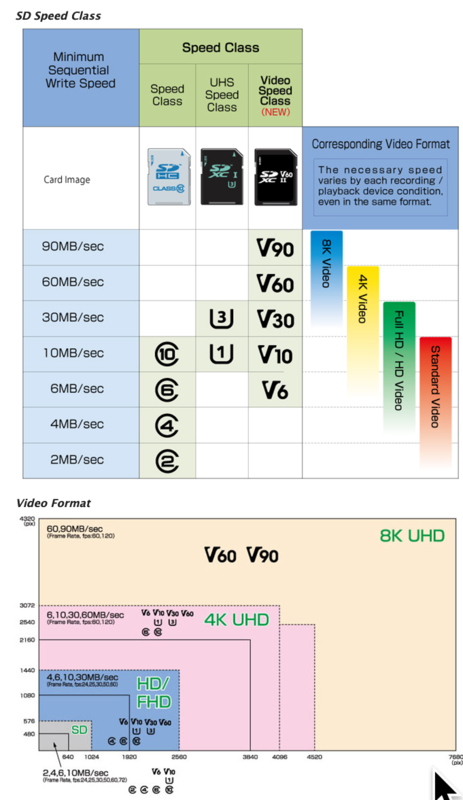 High speed V90 UHS-II SDXC cards are much lower in price than other formats. @P10004K That is simply untrue. Sony Pro Video use XQD, Black Magic XQD. Nikon D5 and D850, XQD, both are more common with pros than the A9, right? The future is PCIe and it seems CF express gets there first. Can SD express catch up? 99% of future cameras will be using SD cards like the PCIe SD Express. XQD will have 1% share. I have been using 300MB/s UHS-II cards in my GH5 for two years now without a problem. @P10004K That is not PCIe, its ATA. @P10004K In the Future, The SD express interface can't even achieve the full bandwidth of one lane PCIe. It's about the pad interface and crosstalk. And the fact that you simply don't have enough pins. Look inside your PC, there is a reason for those long connectors on your display adapter, Bandwidth!! SD express is 985 MB/s vs 1 G/s for one lane CF express (that's type A), but due to the connector on CFe, CF express can do two and four lane, so 2 G/s and 4 G/s, that's type B (XQD) and type C.
Anyone running R&D for 8K has to be looking at this. That includes Pany and Oly, as well as Nikon and Canon. Sony Pro and Nikon already have it and are ready for 2G/s. If 8K at high frame rates takes off as it is predicted to do, SD express has no future. But hey you can figure that out then. @ pwilly Are you the official CF/XQD PR person spreading FUD on SD Express ? LOL I bet there will be more 8K cameras using SD cards in the future than any other format. This isn't an article about SD express. You are the one with the tin foil hat clinging to a standard that may be running out of gas. I have spent the last 40 years moving large amounts of data around for a living. How much time have you spent with engineers that design busses? P,S, My Pany and two of my Nikons use SD. I have found it quite serviceable. There is a possibility it is not the future. Get over it. Guys no matter how you spin it there is no case for XQD or CF Express or any other alike format to exist. They are gone. Nikon and Canon can try to shove anything they want and that is why they lost the market and no one cares about them anymore. Now Fuji, Sony, Leica are doing SD and that is the one format to be used. These are the companies that own the photography space in 2019. End of story. Canon and Nikon can get in line or get out of the business. @Kiril and @P10004K, I agree that SDExpress will be widely used and good enough for most cameras, but you seem to be ignoring the speed difference. SDExpress uses one lane of PCIe (maybe the card size limits it to only enough contacts for that) while CFExpress Type B (the XQD-compatible one) uses two lanes and so can be twice as fast. That is not only useful for high quality video and high frame rate stills, but also for quickly _reading_ the card at the end of a shoot. For example to read a full 1TB card, one lane needs about 17 minutes; two lanes can do it in half that. And Type C is twice as fast again, for special high-end needs. OTOH, I cannot see a promising market for CFExpress Type A, as it is so close to SDExpress in specs and SDExpress cards will offer backward compatibility with SD devices. BJL what is the point of putting those card slots in today’s cameras? First the fastest cards we have today are around 400MB/s for XQD and 300MB/s SD. But more importantly my camera shoots 10fps with 42 MB yet it only writes with around 200MB/s. I suppose there are faster cameras but evidently 1000MB/s in SD express is neither possible or usable by current tech. However using SD cards in multiple cameras is very real. Nikon and Canon with CFast and XQD are taking this option away. This is called lock in and is used by companies to keep customers around when no other competitive advantage exists. Ugly stuff. Also CFast and XQD are much more expensive and evidently prevent vendors from using two cards of the same type. So these new obscure standards are not delivering value. Instead these come to serve the mischievous lock-in agenda of vendors that have nothing else to offer except exotic proprietary needlessly expensive memory card technology. @kiril I agree that SD and then SD Express will be the best choice for most cameras, and will continue to dominate. But there surely will be some high frame rate and high bit-rate cameras that can write at faster than 1GB/s once the new PCIe-based cards and hardware take over. Those 42MB stills hit that speed limit at about 24fps, and there are still cameras hitting 60fps; likewise uncompressed raw 4K video at 120fps or future 8K at even 24fps. But maybe the big win will be read speed for people who actually fill high capacity cards with video: halfing the time to get that video onto the computer. What is wrong with Thunderbolt 3. It is available today. No need for new inventions. If you shoot 60p 8k etc. just use the appropriate technology. Kiril, that is a fair question. I suppose you mean why not use the USB-C plug with Thunderbolt 3 protocols, so like external flash drives with USB-A plugs, but much faster, and maybe slimmer to go inside cameras. Likewise, why have cameras not used memory devices based on USB-A plugs and sockets? Also, this is just as much a question about SD cards, and more so about transitioning to SD Express cards: why use them; why not instead use devices based on USB-C/Thunderbolt plugs and sockets? OMG, it looks like people are going off the deep end now. "Also, this is just as much a question about SD cards, and more so about transitioning to SD Express cards: why use them; why not instead use devices based on USB-C/Thunderbolt plugs and sockets?" What exactly is so hard for you to deal with SD cards ? @P10004K, you misunderstand me, I have nothing against SD cards and expect them to be fine for my purposes, and for the great majority of cameras. But I see that a small proportion of cameras will need things like CFExpress Type B, for the higher data rates (and maybe higher capacities, from the larger size.) Also, some professional video and cine-cameras will be better off with the even faster Type C, which hopefully can replace a bunch of current proprietary formats. The words of mine that you quote were rebutting the idea that (a) there is a place for SD Express cards [definitely! ], yet (b) Thunderbolt 3 eliminates any need for CFExpress. I see no way that TB3 makes one of these new PCIe-based formats irrelevant but not the other. Actually, I am fairly sure that it is not practical for camera memory cards to connect directly with TB3 (via USB-C plug), so getting the performance advantages of PCIe and NVMe need both SD Express (for most) and CFExpress (for a high-speed niche). Pro cameras like RED Cinema, Sony Venice , Canon C700 etc. 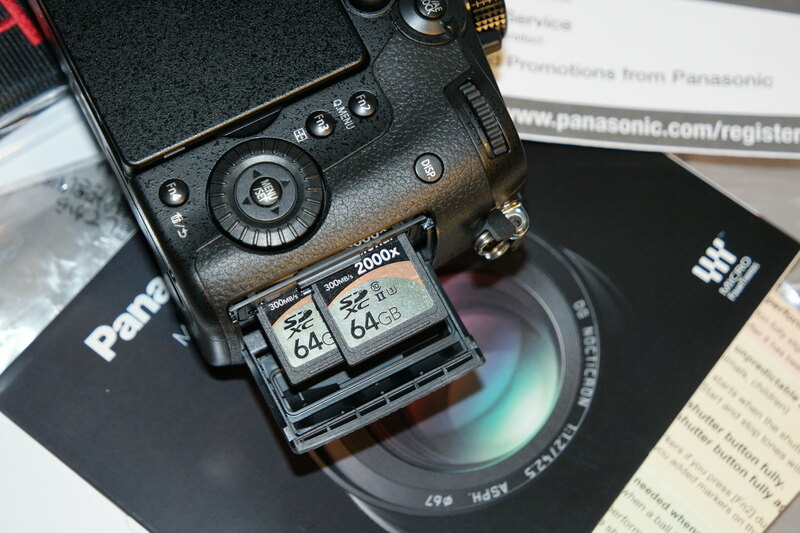 will use the larger format cards but for 99% of users SD cards will be the standard for many years to come. Sony did not even put two UHS-II slots in the A9 like my GH5 and made a bonehead move by having one UHS-I and one UHS-II. BTW the full frame Sony Venice that is used for current movies in production like Top Gun :Maverick uses two ExpressCard/34 slots & one SD card slot . @P10004K Yes, I basically agree—except that I expect the high speed “pro” needs to come a bit further down, into some high-end still+video hybrid mirrorless cameras, for options like 24MP+ at burst speeds of 30fps+ (some cameras already do 60fps stills) or 4K raw at 120fps, or 8K at any video frame rate. Or just to offload faster from TB cards. The niche for CFExpress will get smaller in a year or two, once SD Express arrives. SD cards use SPI communication protocol and not ATA. Seems like someone is smoking too much of bad stuff. @Chaitanya S, I am not sure where SPI vs ATA comes in to this discussion; who mentioned ATA? SD is moving to SD Express (with backward compatibility with whatever SD uses now), and that will use PCIe and NVMe, then same combination as CFExpress. P. S. Oh I see now — pwilly is talking about SD using ATA. Just a note many modern cameras have USB-C for tethering. I do not see reason for them to hold off using external USB-C attached storage that is already available on the market. I also do not understand why cameras lack big internal storage i.e. SSD. What is wrong with built in 256GB and single slot for write behind back up? @Kiril Karaatanasov: "many modern cameras have USB-C for tethering. I do not see reason for them to hold off using external USB-C attached storage." Yes for tethering, but there are lots if use cases that need a hand-holdable camera with the storage secured inside the camera; that is where cards like SD and CFExpress come in. "I also do not understand why cameras lack big internal storage i.e. SSD. What is wrong with built in 256GB and single slot for write behind back up?" A few cameras have offered internal storage up to 32GB, and I could work that as I have never needed more than one 16GB card—but for whatever reason that is not a common option. Maybe the usable life of the flash memory is less than the camera's, so people want replaceable cards; maybe some (professional) photographers like to hand off one card for off-loading while going back to work with another card; maybe it is just a hang-over from when memory capacity was far lower—I started with an 8MB (not 8GB!) card. @BJL: There is one user in this thread who is spreading FUD and misinformation about SD format. Also on serious note it seems like both SD(SPI) and CF(IDE)/CFast(SATA)/XQD(PCI-e) have been replaced with formats that use same NVME communication protocol which will certainly make life easier for designers. Although the CFxpress its doesnt help that there are 3 different size formats which certainly will add to confusion among consumers. @chaitsnya, I doubt the three sizes will actually cause much confusion for camera buyers, because they are aimed at a wide range of fast removable storage needs: only Type B (XQD size) is likely to be used in still cameras, with Type C too big for that, and maybe aimed at high end video cameras and maybe as “removable SSDs” for computers. I do no see much role for Type A, as I expect SD Express will win that sector; maybe it was designed to compete with current SD and was blind-sided by the SD Express announcement. Larger Type-C might replace the Industrial CF and Cfast formats for variety of applications(industrial PC, routers, etc...) along with high end video cameras replacing a lot of proprietary formats. Type A being thicker card than SD Express might have cooling advantage from larger package other than that I dont see any benefits of announcing CF Express Type-a format and CFA might have missed the memo about announcement of SD Express. Yet more sizes and types of memory card. I wish everyone would get behind the SD card as the de facto standard for memory cards, and stop coming out with more formats. SD cards are flimsy and have interface technology from the 1990’s. I just went XQD and now when I use SD for my other tools I vomit a little in my mouth. SD seems like the floppy disk to me now. Cheap, unreliable and flimsy. They seem reliable enough and far cheaper than XQD. I hope you keep a cloth handy for your vomit. Einride, maybe you need to buy some better SD cards so that you don't make such ridiculous statements about them. I've never had an SD card fail and the ones I use are plenty fast enough and they're nowhere near the fastest available. Exactly my thoughts. These XQD, CF Express and other obscure standards don't need to exist. SD cards just last year got plenty fast. We see tough SD cards that are highly reliable. SD card are compatible with everything. I just don't see need or place for this obscure innovation. If higher speed is needed for professional purposes Samsung has already released XS SSD disks on Thunderbolt 3. These are plenty fast and approach in practice the theoretical limit of this "new standard". This s absolute DoA waste of time. SD cards aren't cheaper than xqd cards except you compare utterly slow crap with fast expensive memory. As example, a Sony G XQD 128GB with 400MB/s write speed costs 230€. A lexar 128GB 2000x UHS2 SD has only half the write speed (200MB/s) but costs 212€. 18€ saving for just halve the speed? Makes the slow SD insanely expensive. A Sony 128GB UHS 2 SD card with 299MB/s write speed costs 249€. It's even more expensive but still 100MB/s slower. So show me, where are comparable SD cards cheaper than XQD? I mean, just because you don't need fast speeds doesn't mean other people wont need it either. You mean the SD card with all its form factors? SD, Mini SD, Micro SD, Micro SD Express, Nano SD (also known as nm card). Heck it has even more formats. Actually, I would rather prefer CFExpress 1 cards or CFExpress 2.0 Type B cards as the SD successor as they offer more space for chips (allows more memory packages or SLC/MLC instead of TLC/QLC, wear level ceiling chips, better heat distribution, etc), are backwards compatible with xqd (despite I don't own a camera with xqd slot; staying CF till it is clear where it is heading) and allow a more robust casing. I've had a few SD cards breaking apart while inserting or taking out of the SD slot and in one case even by taking it out of its plastic case with the sd cards backside remaining in it..
For now and then shooters SDs are fine, but if you take over 100k photos a year outdoors during cold and hot weather and have lot of memory card switches, well, SD shows its face of being not as robust. Where are the cheap XQD cards? The cheap SD cards work fine for me and never had a failure. Way fast enough for me and I don't need anywhere near 128GB. Just because you want insanely big, fast and expensive cards doesn't mean everyone does. I was only responding to the ridiculous vomit comment anyway. Well were where the cheap SD cards after the same age of XQD/CFExpress? And to be honest, who would switch to xqd if there are no strong benefits after release? (speed in this case). And the patent situation with sony also is a problem, therefore the successor CFExpress is much welcomed. I'm sure manufacturers will start making cheap but slower cards if this gets rolling but it takes time for new formats to settle. Or why do you think manufactures and the users will switch to another format, if it doesn't have advantages. For most people, endurance, case stability etc doesn't matter so much but speed always is something (like the MP war before and nowadays the DR war). The best accepted advantage needs to be pushed first, meaning the strongest niche (honestly, who really needs 14EV DR instead of 13EV or 42MP instead of 28, 30, 35MP). Not reading all that. I just said I was replying to the vomit comment. Do you vomit too? true, why even drive cars when we can ride horses? Well I could vomit about people complaining about three sizes of CFExpress 2.0 and hailing SD which has more than five.. (just named the five more known in the post to jonathan but there were more sharing the SD interface/idea). It's the same thing with image formats. JPG is insanely old and there exists better ideas which don't result in blocky images if strongly compressed (like bpg) but people wont change to something superior. That's the problem with people not open to new things and who are saying why change something if it was always like that. Especially regarding toward IT things, we live in a fast changing world. I know it is difficult but more acceptance for new things would be nice. The benefits for the masses come if new things manage to settle but the doom loop says it must be accepted by more than a small niche first.. I wonder what the prices will be? so there's no camera that can take this type C 4000MB/s card? is there at least a card reader that can read this card? Not yet but I could imagine canons 13k video sensor needing such a speed when raw video is desired ;-) We live in a fast developing and changing it world, 4k is barely spread (Monitors, TVs, cameras with high bitrates to benefit from the high resolution) while 8k already is in development and also some 8k Monitors already exist for insanely high prices. From a standard to an actually product takes time and till it is finally settled and stable, the need will be there. Which one does Sony have all the licensing rights to? That will be the one Nikon will choose. Sony has licensing for XQD. Same form factor as CFe type B. Since CFE is open standard it will most likely be cheaper than XQD. They need to go SD only and stop this BS. Yes, I realize XQD cards have the same form factor as the type B. I am hoping that Nikon will firmware update their DSLRs for CFe type B. Do I believe the 120Gb card will be less expensive than a 32Gb card? No. Do i really need a 120Gb card? No. The 120Gb card will be great for those shooting 70-100 Mp cameras. GREAT! Just what we need! More versions to choose from, more incompetent abilities, more adapters, and more s..t. If cameras would offer all card size slots available for easy compatibility, they would be about 300 and the camera would be two and a half feet long to accommodate them. I can't wait for more cards of all shapes and sizes! Heck, I just played around with a friend's mental retard Huawei stupid new phone yesterday, and that one had a new kind of miniSD card that is totally different and incompatible with any kind of hole you can stick it into or adapter! Grand! Yeah, that's the nano memory (NM). It's actually shaped exactly like a nanoSIM so that a single slot can be used for both types. It's ok "zoom", 90 year old people usually have trouble with technology, so you're not alone out there! And who said we need SSD for faster performance? LO. But this is also SSD. Everything but cheap physically large disks is now solid state storage and it uses the same memory chips inside. This is essentially no different from your M.2 PCIe SSD drive you would plug into your laptop or PC motherboard. The interface is PCIe (with NVMe and AHCI protocols), the storage medium is NAND flash. The only real difference is the form factor and connection, which are optimized to be used as a removable media in case of CFExpress. Is there a list of how many cameras that can use these SD cards? I might be interested in them if any Sony cameras could use them. But then, I don't think any Sony cameras can handle 4000MB/s anyway, so what is the point? How may cameras need 4000MB/s speed anyway? These ain't SD cards but CFexpress. It’s a new specification. Zero cameras use this new specification today and zero cards are available. Nikon, and Sony professional Video users will get a firmware update. Sony ML Users will buy new cameras, but they knew that. Nikon will enable CFExpress. But CFExpress 2.0, with the additional speed? I would guess no! The idea of splitting into multiple sizes means will make it much more difficult to succeed, IMO. I'm glad I didn't invest in the last one. This new announcement makes it obsolete. The new SD cards are super fast and I think I'll stick for the time being with those cameras. Currently XQD card is approximately 10% more expensive than the latest Type II SD card of similar capacity but the XQD card is 400 MB/s R&W whereas the SD card is only up to 300 MB/s R&R. I explained it already with the 3 sizes. I mentioned nothing of prices so I don't have a clue what that has to do with what I said. Don't you think that in today's world that it's just a little odd having interchangeable memory cards? Must be a throwback to film. Both my cameras have dual SD slots and I rarely fill one during a single session, I always think there is a certain vulnerability in having those extra connections between card and camera and feel that it would be very easy for manufacturers to include a very significant memory with some sort of wireless backup device. Adding more choices for memory has to be step backwards? I certainly think it would be worthwhile having some internal memory *in addition* to removable storage, but it would significantly increase the cost of cameras. It would be a very bad idea however to have to rely *solely* on internal storage. What would happen if your camera developed a fault and you were unable to recover the images on the internal storage? Most dpr readers seem to think that having *twin* card slots is a deal-breaker, and I totally agree. Don't underestimate the importance of redundancy! Especially for pros or for shoots that are impossible to repeat. Explain what roll raid plays. It most certainly is a reliable redundancy, though it's not archiving. We're not confusing the 2 are we? @Tommi K1: Who wrote about RAID here ?? Tommi - What are you prattling on about? This thread is about options for in-camera fixed or removable storage, and has *nothing* to do with RAID external backups. No. Removable storage is the call. First, you can quickly replace full media on a shoot. Second, you can offload that media with a cheap reader while you’re shooting. Third, a broken connector on your camera (or broken camera) doesn’t prevent you from retrieving your pictures. Not to mention that flash memory wears out. I bet my dollar that within the next 10 years, we'll see new memory cards format using the newly announced CXL (compute express link) interconnect. Coupled that with UFS memory format, now making it's way into the handphones. Even in the digital world, size matters. let say you shoot burst raw 48mp 20fps. you need at least 2000MB/s storage to help your buffer to save in real-time. Will be? When? I'm seriously considering a Nikon Z6, but don't want to pay $100 to Sony as part of the deal. Or have to buy a crappy reader that breaks like the one I rented once when testing the Z (thankfully, I had a USB-something-or-another cable that connected to the camera). Otherwise I would have been hosed. I really wish the camera and device manufacturers would get together periodically and agree to all use the same card format for a given period. It's bad enough having to have a mix of CF and SD on my Canons, but for people who run dual systems it must be a real pain. Now we have CF, SD, XQD, the Sony stick thing, and 3 different formats of CF Express. It's getting ridiculous! CF, XQD and Sony stick (what??) are dead. Memory Stick Duo/Pro Duo/Pro-HG Duo, accepted by all Sony a7 series and probably by most other Sony cameras. In addition to SD/SDHC/SDXC. CF Express is not going to be a problem. You will have one size for your still cameras, another size for big video cameras, and one size for your computer gear. Add CFAST (1DX Mark II) to your list of Canon formats. Finally! A real protocol for flash memory! NVMe delivered. I'm not quite sure why the smaller versions can't handle 4 lanes, at least the medium size, but this is really great. Everybody hates another memory card format but this is what it should be. Though it may be a bit ahead of it's time. PCI-E 4.0 is looming which would double these bandwidths per lane. Takes time for a new format, maybe that's the one we can finally embrace. A 4x 4.0 NVMe is pretty much as good as it's going to get for a long time to come. What is wrong with the PCIE / NVME in SD-Express? SD cards are very fragile. SD-Express can't keep up speed-wise. @panther fan: SD Express will probably be the best choice for most uses, but CFExpress Type B (the XQD heir) is twice as fast, by using two lanes of PCIe. It can probably go to higher capacities too, being bigger. CFExpress Type A seems aimed at competing directly with SD, and in fact is slightly smaller, but I am not sure that it has much chance, unless it is more robust and wins on that. It will allow more bandwidth over the same standard connections. So SD is going to go away. "SD cards are very fragile." BS, SD cards are in 99% of cameras and I have never had an SD card fail. SD Express is for 8K video @120fps ( 985MB/s). Fly18 - I've got about 30 SD cards, a mix of Sandisk, KIngston and some unbranded ones. I've had some of them 5 years and all have been used multiple times. Many have been accidentally dropped. I've had a couple of occasions when cards have corrupted, but I've *never* had a card break. You must treat your cards extremely roughly. Do you bend them, stamp on them or just hit them with a jack-hammer? I never liked SD. The connectors are very exposed and prone to failure due to people accidentally touch them. But the market selected it because it was smaller than CF. I've never had one single CF failed but I've had read error with SD before (not frequent, like twice in five years, but can give you heart attack when it happened if you have mission critical photos on the card). And SD just downright slower than CF (don't believe the rated stats, SD has never been faster than CF in practical use. And as the card capacity filled up, for whatever the reason, write time becomes slower and slower). citizenlouie - It's funny how different people have different experiences! I agree that SD is slower than CF, and possibly more prone to read or write errors, althouhh the latter is very hard to prove. But I absolutely loathe CF cards, having twice in the last 10 years accidentally bent the pins in the camera when pushing in the card during a hurried change. Almost everyone I know has done the same thing at some stage. On many cameras the sensor and other electronics have to be dissembled just to change the slot, and it can cost as much as $200 to get a CF slot replaced. Slot failure just doesn't happen with SD. @entoman no biggies, people do have different experiences, otherwise we'd all be robots. I've heard about the bent pin issue, but I've never had such issue, not even with CF card readers (which tend to be cheaper made than Olympus cameras I used). CF does have guide rails on the side, so I don't understand why bend pins might happen unless the pins are really badly made. But that can be easily remedied if pins are thicker. The new standard seems to use other type of connector, so that's resolved. Otherwise, Serial ATA style connectors might be another good candidate. I'm all for asymmetric design so people won't plug in their device the wrong direction. I tried to help a poor tourist with his memory totally unable to read while he was in the middle of a tour before. All I could tell him was sorry, he should have formatted his SD card more frequently, as statics discharge from our fingers happen regularly whenever we remove the SD card. Some people tend to shovel-in cards with force, like a gun magazine. That's why and who get the pins bent. I've never had any issues with CF. But I did with SD, because of their stupidly exposed pins design that can get dirty and lose connection, as well as makes it possible to damage/corrupt the data by touching them with some occasional static electricity on you. SD cards can’t die fast enough as far as I’m concerned. Small, flimsy with exposed contacts. CF cards aren’t much better. XQD cards are the best by far in my experience. CFe will likely be even better. I like how XQD cameras like the D850 and Z cameras will he updated to CFe through firmware. Yeah, it will have to be that!! It's interesting how people even become "fans" of memory cards! Can' accept the fact that a newer standard with better hardware could potentially be the future! Fly18 - I'm all in favour of improved cards that are stronger, assymetric and as future-proof as possible. I just wish that all the camera manufacturers would get together and agree on a format that they'd all use for a fixed period (say 3 years between reviews), so that we don't have 6 or 7 different card formats at a time to contend with. The industry needs more standardisation - not only with memory cards, but with battery types/sizes, dedicated hotshoe pin lay-outs, and even to some degree with camera controls (why do some lenses focus clockwise to infinity, and others anti-clockwise? it's just plain stupid). Standardisation of this type doesn't stifle design or functionality, it just requires cooperation between manufacturers..
SD Express is smaller than CFExpress Type B, and so will probably be preferred for all but very high speed, high capacity needs like high quality video. SD Express vs CFExpress Type A is very close on size and speed, but SD Express could win due to backward compatibility with older SD versions. It's not because of the small size differences. Sometimes compatibility with "ancient" stuff has to go for the greater good. I'm afraid that idiotic camera card slot type mixing will continue. There are CF+SD, CF+CFast, CF+XQD, XQD+SD and now there will be CF+CFe, SD+SDe, CFe+SDe with various type permutations. Human stupidity has no limits. The good thing about standards is that we have so many to choose from! And every time they bring out a new standard to unite everybody we end up with one more, not less. But smart camera makers are going to see CF Express is so much better than any other card currently used that they will migrate to that. @ewelch - Not every time. Only when random people decide what to do. @cjb Your remark was perfect. Way better than the comic. I feel a better solution would be to just move cameras to the m.2 standard and just allow users to install m.2 SSDs into their cameras. Compared to XQD, an m.2 NVMe SSD can offer 4 times the capacity, 5-6 times the read and write speeds, and 10+ times the IOPS for the same price. While CFexpress is going to be faster and use the same protocol, the different form factor and the photography focus will likely cater to the price gouging nature pf the photography industry, where like the apple and gamer tax, adding anything remotely close to photography in the name or description, instantly causes the store to price gouge. m.2 SSDs are a terrible idea since they are not build to be unslotted so often. They also are in no way resistant to rough handling. If you want to go the SSD rout the cameras could simply come with pre-installed non-removable memory. Non-removable storage would be bad since then write endurance will be a major limiting factor to the life of the camera. Non-removable is fine in devices that you may replace every year or 2, but if you plan to use it longer then there are risks. The plating and contact designs on an m.2 SSD are the same surfaces found in SD cards, thus durability should be about the same. Not at the size of an XQD card. My Pluggable PCIe external enclosure running USB 3 gen 2 is barely bigger than the 1TB NVMe PCIe 2280 stick inside, and it's running around 950Mbps read/write. But it's much bigger than my XQD cards. In looking at an XQD card, the contact thickness and size is the same as with an m.2. All that would be needed to make m.2 stronger will be to just sell cases for the m.2 SSD which protects the exposed PCB. Thus you buy the NVMe SSD of your choice, and then using a cheap m.2 caddy, you make it compatible with cameras. It will be smaller than the type C CF express card, and slightly longer with a size of 22mm x 80mm compared to the CFexpress at 54mm x74mm. The CFexpress Type A card has the same size as an SD-Card. It uses the same single lane PCIE 3.0 interface and even uses the same NVME protocol as SD-Express. So for all intents and purposes, it will have the same speed, the controllers could even be interchangeable and you could build a passive adapter. Agreed. If I buy a new camera, one essential for me is an SD slot. Nothing else. The SD format is the nearest we have to a universally accepted format, like the 35mm film canister. Nikkor Z7 Mark 2 will have 2 CFe Type A cards. For speed reason it will be type B (2 lanes), and XQD size. At 1000 MB/Sec max, CFe Type A is likely to be faster than the current XQD cards, which are 440 MB/sec, so speed is not a reason to require Type B.
Dual Type A would likely fit within the existing Z7 body size. Dual Type B would clearly not. So I agree with Fly18.